Armistice Day, World War I: It arrived on the 11th hour of the 11th day of the 11th month in 1918. The war ended after 4-years of fighting including an estimated 11,000 lives killed in the last day of fighting. Henry Gunther was among them, the last American soldier to die. And then, it was over. From the battlefields of France, Belgium and beyond men who were once enemies shook hands, swapped cigarettes, sang songs and danced. From Paris to London, Washington, and New York, armistice celebrations unfolded. The suffering of war replaced by rejoicing. In the video below watch scenes of the WWI armistice countdown and subsequent celebration. Armistice Day brought relief, celebrations, and joy for millions of people. It also brought a permanent loss of innocence for those countries, including America, and lives, including Americans, who were forever changed by WWI. An estimated 9-million soldiers died in the fighting. Millions more were wounded, gassed and permanently scarred in the war. On 11/11/1918, the bloodiest, most miserable conflict in history until that time was finally over. 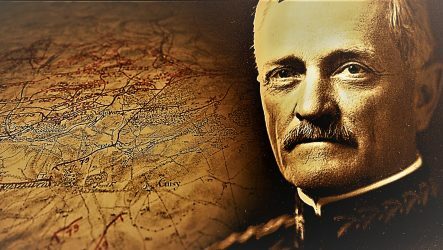 WWI General John Pershing's recorded voice was first heard in a speech he recorded from France on April 4, 1918. Radio stations didn't exist so Pershing's patriotic message was distributed as a phonograph record. Five years before America entered World War II, John Pershing warned of the rising threat Naziism posed to the rest of the world. “Watch the Media” host John Shrader’s interview with “Black Jack Pershing: Love and War” director and University of Nebraska-Lincoln Professor Barney McCoy.